For our recent shoot of the video of Morning Blues by up coming artist Rose Gray, we worked with a motion control rig supplied by the London-based The Visual Effects Company. The resulting video is, if we say so ourselves (! ), stunning, in no small part due to the rig and its operators. With visual effects playing such an important role in so many feature films and videos these days, we chatted to Digna Nigoumi, (one of the founding members of The Visual Effects Company,) to find out more about motion control techniques and this fascinating side of the industry. Q: Hi Digna, thanks for agreeing to this interview with us today. Please can you start by explaining what visual effects and motion control are? A: Visual effects is a technique that allows images that have been photographed or filmed to be changed or manipulated in order to create a different image that might be very expensive or impossible to film normally. There are many different areas of visual effects but my specialist area is called motion control. 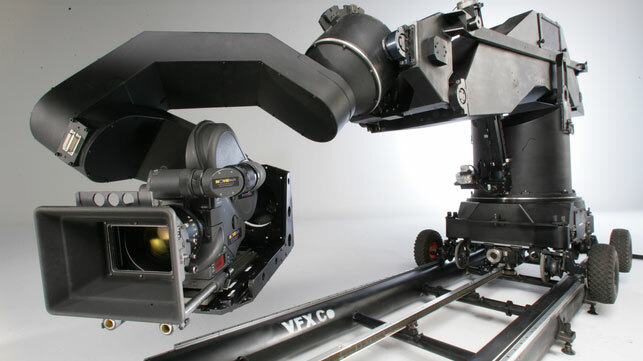 This is a very accurate type of robot that has been specially made to hold a motion picture camera. A computer controls the robot and I can give it a programme and it will move in a very precise way. There are many different systems for many different applications but generally each system has multiple axes and can travel along rails. Some can move at very fast speeds, others have vast operating ranges and some are compact and simple. Most will have software functionality to assist with operations such as stop-frame (used for animation), time-lapse (to compress many hours of action into a few seconds) or CGI import/export (to be able to import/export data from/to a third party system). Aside from the main axes, it also has the ability to control camera run, focus, zoom, iris, shutter angles and a whole host of different model movers and lighting desks options. Virtually anything can be controlled. The computer systems have the ability to store move information for later recall. Each time a move is run, it follows the same path over and over again, and it will do it extremely accurately. This means when recording using the camera on the robot, each time the robot moves the movement of the camera will be the same and therefore each piece of film will be the same. If each piece of film is the same, they can be mixed all together in an editing room and there won’t be any difference. But, if something has changed in front of the camera (the actor is in a different position, for example), then when the two pieces of film (called ‘plates’) are mixed together you will have the same actor in two different positions at the same time. We can also use the computer programme to pretend that the robot is very small or very big. If I have a model of a building, and I want to make it look really big (like the factory in Charlie and the Chocolate Factory), I would make the robot do a tiny little move around the model and it will make the ‘filmed’ image of the building look really big. Or, if I want to make a man look small (like Ant Man), I would tell the robot to do a great big move and it would make it look like the man is really small. There are many different ways that motion control can be used and utilised on a film set. Some are very complex and require a lot of thought, planning, programming and testing and others that are more ‘turn up and shoot’. Each job has its own unique set of challenges and disciplines that require technical knowledge and experience to ensure a professional outcome is always achieved. A true motion control system allows complex functions such as move editing, mimic control and curve smoothing, target tracking, scaling, forward and reverse running, triggering, frame sync, part running, import and export of CGI data, model movers, Cartesian control, etc. In short, the ability to ‘control the motion’, whatever that motion maybe. There are a lot of ‘repeat’ systems that are available in the market that say they have ‘motion control ability’ but actually they are just repeatable heads or dollies and cannot really offer much more than simply repeating what the operator does. Q: How did you get into this specific part of the industry? A: I started in the industry in June 1989 aged just 22 having studied an audio visual course at art college. I applied for a job as a runner at a small but upcoming company called Cell Animation. This was a vibrant time in the commercials and graphics world. Production companies and directors had wild ideas and big budgets and were not afraid to experiment visually. Many were constantly looking for the next big technique to showcase their talents and Cell (as it was known) had central London studios, editing suites, CGI facilities and animation rostrums plus lots of young creative staff keen to push the boundaries of commercial filming. Cell also had motion control systems. I knew nothing of these strange machines but was fascinated from the outset. Within a few months, I had been given the chance to learn the fundamentals of what they did and how they are controlled, and when the opportunity arose to become a full-time trainee assistant I jumped at the chance. As time passed, I progressed from studio trainee to proper assistant and then, after a few years, to senior operator. In May 1996, another motion control technician called Malcolm (who later became my business partner) and I, along with a few other senior department members, were approached by The Mill to set up MillFilm, a subsidiary of The Mill that would concentrate on feature film work. With new equipment and a permanent studio at Shepperton Studios in Middlesex, we ran the motion control department very successfully for six years until, in 2002, The Mill decided that it needed to close MillFilm to dedicate more efforts to the main company. Malcolm and I decided that we would set up on our own and negotiated a management buy out of the equipment and The Visual Effects Company was born. Since then, we have continually re-invested in the business and equipment and are now one of the world leaders in motion control filming. Q: What makes the Visual Effects Company stand out from your competition? A: We pride ourselves on giving a professional service from initial enquiry to completed assignments and are able to offer bespoke solutions to a wide range of projects. We have a studio in central London and a very diverse array of motion control systems available to suit every budget. In addition, we can act as a production company and take on the challenges of a full-scale shoot, be it with or without any of our professional in-house services. Q: Can you give us some examples of interesting pieces of work of which you are particularly proud? A: Over the years, I have been involved in many thousands of projects of all different shapes and sizes. We have shot on major Hollywood blockbusters such as Saving Private Ryan, all eight Harry Potter films and Dr Strange, to low budget, self-funded short films and commercials that never made it to be shown to the public. But I have to say that one of my favourite pieces was for the video of As for the late, great George Michael featuring Mary J Blige. We shot this in about 1998 in a disused nightclub in Stratford in London. We had two Milo motion control systems on it for six days, with nine different motion control moves and each move consisted of around 80 separate plates all of which were triggered from the soundtrack to ensure lip sync with all the various ‘Georges’ and ‘Marys’ that were in the scene. It was quite a piece of work to do at the time and I think that it shows a fantastic use of motion control techniques that still stands up today. It’s definitely worth a Google if you’ve not seen it. Q: What innovations can we expect in future in VFX/motion control? A: The world is constantly changing and technology is forever evolving. This naturally leads the VFX industry in new directions and poses new issues. The digital camera age has taken over so quickly that it’s hard to see where it will take us next. For example, high-speed photography used to be reserved for the big budget jobs as it involved very specialist cameras, technicians and equipment, but nowadays it is available for even modest budgets. Therefore, a range of high-speed motion control techniques and systems has been developed to facilitate the market needs and keep pace with current trends. Throughout my career in motion control, I have realised that the systems need to be designed with an emphasis towards reliability, robustness and usability. Smaller lighter motion control systems are in demand right now as budgets get squeezed, but unfortunately clients always seem to want faster, higher, greater range systems, which means that they have to get bigger and more rigid. I think that the future holds a clever smaller designed rig to utilise lighter camera formats but still allow all motion control techniques to be used. Q: You worked with Element 26 on Rose Gray’s new video using a motion control rig called Sprog. Can you tell us something about some of the different equipment you use and what it does? Cyclops – this weighs 2.5 tonnes and the rail is 4 tonnes. This is used for fast, precise shoots that require a large range of motion, for example, those on the films Pan and Prometheus. Milo – we consider these the workhorses of the fleet. They get used the most, as they are portable, fast and precise with a comfortable operating envelope. (These were used on the Harry Potter films and Gravity). There is a long arm that fits Milo to increase its range to up to 30 feet, used, for example on Tarzan and Cinderella. High-speed robots are used for super fast action shots, for example on Dr Strange and King Arthur. Q: How was it working with Element 26? A: It is always a pleasure to work with clients that appreciate our work and understand the complex nature of what we do, and Element 26 was no exception. Thank you.